Wow. Well, I know for a fact that the duplex next door was bought by my parents in 1953 and we moved out in 1959, and they rented it to a family for probably 10 years after that. 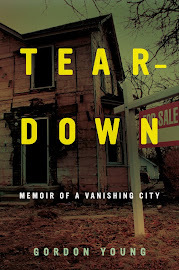 We lived in the side nearest Saginaw Street, and rented out the other side. Our address was 616 East Taylor Street. My dad put the front porch trim up - he worked at May Lumber Yard. Never in a million years did I think I would find my old home on a Facebook link! Wow, this is a coincidence. Thanks for a little history on your old house. What's really amazing is that both these houses are in great shape. It seems like one person owns both properties. They've survived when most of the surrounding houses have not. At first, I game allowance for the possibility of the same design being built on two lots. The photos are remarkably similar, but it still could have been two different houses. Then, I compared the adjacent houses. They, too, were identical. That cinched it for me. It's the same house and kudos for the owners over the past Century who maintained it. Going with the assumption that the houses were renumbered. Perhaps the 671 house was renumbered to 625. 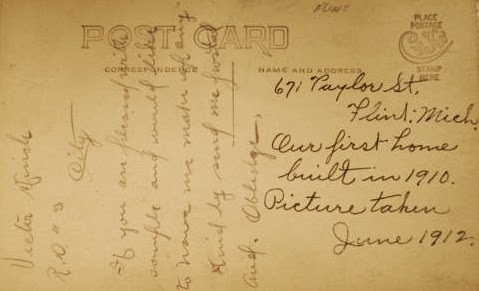 The 625 house is the same design as the one in the postcard, with the same front double window in the center of the second floor. The porch railings would have been modified. The view of the 625 house is blocked by a large overgrown tree in the parkway, but it is visible from 621 E Taylor on Google street view. E Taylor St: 620, 625. E Baker St: 510, 525, 630. E Dayton St: 503, 605. There are also two similar houses at 606 and 614 E Dewey St (without the side gabled dormers seen on the above 10 houses). 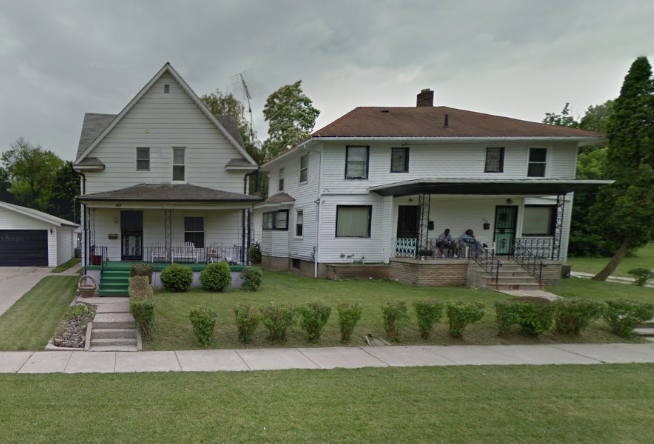 My parent's first house in Flint was at 605 E Dewey. Across the street is 606, one of the clones of the 671 E Taylor house. That is why the postcard image looked so familiar to me. Our old house is still standing (per Google street view), but with most of the aluminum siding stripped away. 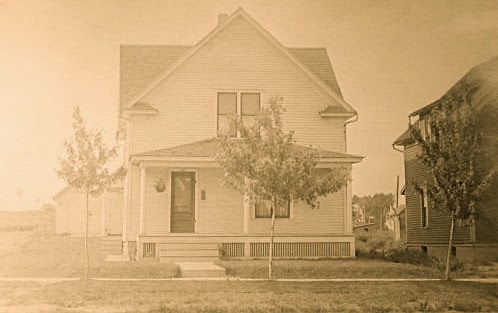 It is in a sad state compared to a late 1940s photo that I have of our old house.